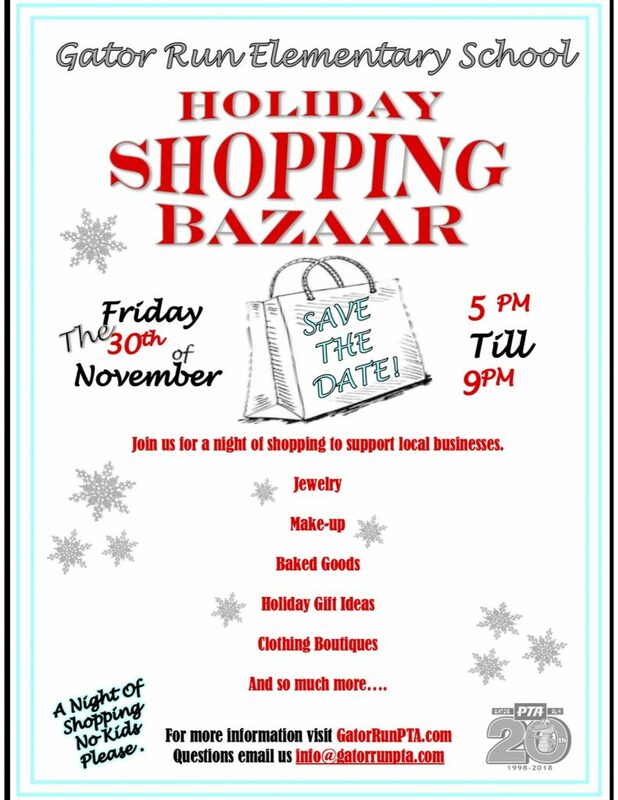 Please join us for a night of shopping! Featuring goods from local small businesses. Shopping to support the small businesses in our community! November 30th – click add the date to your calendar ! Below please find more details for those wishing to be a vendor at the bazaar. Gator Run will make every effort to host no more than five (5) vendors at the Holiday Bazaar within each of the following categories: Jewelry, Personals, Fashion, Garden, Home Décor, Kitchen Items, Kids Corner, Pet Items and Edibles. Company is responsible for paying to Gator Run PTA a $100 fee for your booth. Total Amount is payable to ​Gator Run PTA ​by check or cash. In order to be considered a vendor, booth payment must be received at the time this agreement is submitted. Vendors who wish to cancel must do so at least three (3) weeks prior to event date, by email to ​info@gatorrunpta.infoor by calling Julie Camunas at 954-609-2817. No refunds will be given for cancellations after this date. On November 30th​ ​, all vendor booths must be setup and open for business by 5:00 p.m. Vendors will be allowed in the cafeteria to begin setup at 4:00 p.m. Vendor parking and unloading instructions will be sent to you two weeks prior to event. Vendors will need to bring a table, tablecloth and any displays or props necessary to showcase goods and services. If you would like to rent a table from the PTA, please notify Julie Camunas via email at ​juliecamunas@gmail.com by Friday,November 23, 2018. Each vendor will receive a 10’ x 10’ space in the cafeteria. Please plan your booth display accordingly. Extra space will not be available. At no time shall Gator Run be responsible for the security of Company’s property. Company will be permitted to capture the names of shoppers by hosting a drawing at your booth. Company shall remain setup for sale until all guests have departed. Breakdown time will begin at 9:00 p.m. You must have all items out of the cafeteria by 9:45 p.m. sharp. Vendors are invited to further promote Company by donating a gift certificate or item(s) for the annual Multicultural Festival. To participate as a vendor please download and review the below contract. You can reach out Julie Camunas at 954 609-2817 with any questions.